A large melon, often weighing up to ten pounds. The Crenshaw is one of the more succulent melons with a dense, tender aromatic salmon-orange flesh that is both sweet and spicy. 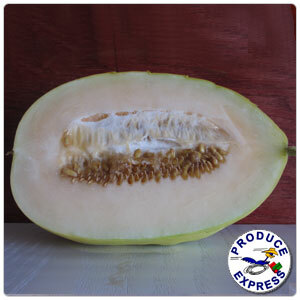 The Crenshaw is a hybrid cross between the Casaba and Persian melon and is often regarded as a dessert melon. Anywhere melons are sold, they are looked at, felt, shaken, tapped, weighed and sniffed, the customer always in search of the perfect melon. Melons should be heavy in weight, an indication of freshness. Avoid melons with soft skin or blemishes on the skin. To store, keep melons at room temperature for two to three days. Refrigerate ripe or cut melons up to three days. Remove from the walk-in about one-half hour before serving for best flavor. Aromatic melon varieties are prized for their flavor and perfume and are rich in vitamin A and C and provide dietary fiber. Melons are related to cucumbers, pumpkins and squash, growing as they do on long, trailing vines.